Today’s post is a long overdue accountability report. 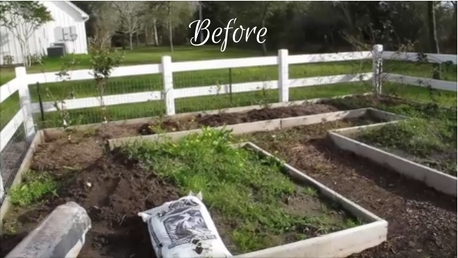 Way back in February, on a Front Porch Friday video, I took you on a tour of my vegetable garden, and the neglect you saw in my garden revealed my own neglected soul. God challenged me through that verse to set time aside in my busy schedule so that He could give me rest and replenish my soul. I recognized that He was calling me to go outside, get my hands in the dirt, and let my heart connect to Him. And I committed to do that and to be accountable to you by providing pictures and updates of my garden. 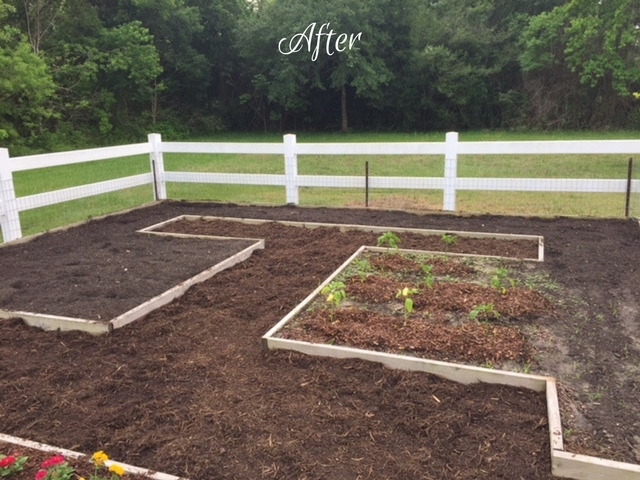 So today, in the spirit of accountability, I’m sharing a few before and after pics from my garden. As you’ll see, there is still much work to be done, but my garden — and my soul — have come a long way since your first garden tour. Take a look. Weeds were everywhere! But this little patch was where I began. 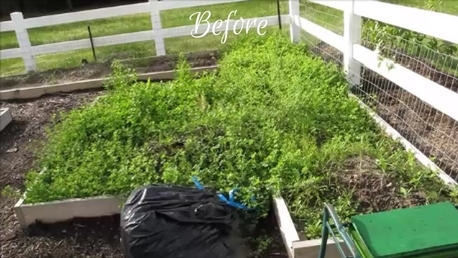 After I removed all of the weeds, Bill tilled the soil until it was gorgeous again. 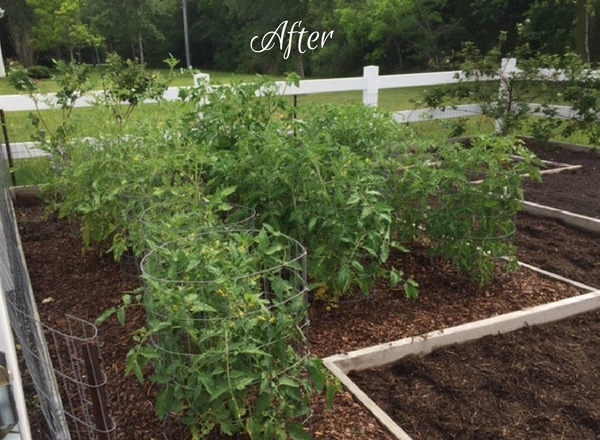 Next, I planted a dozen or so tomato plants, added mulch to prevent more weeds from growing and . . .
Hallelujah! My tomatoes are now growing, blooming, and setting fruit. Makes me (and my soul) so happy! 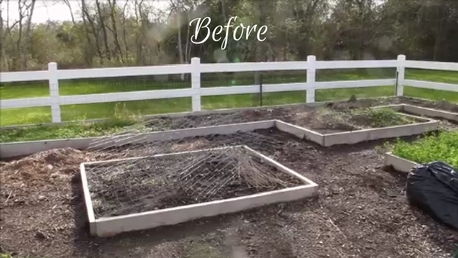 As you can see, this section was where all of our old tomatoes cages had gone to die. And surrounding that all of that ugliness? More weed-infested beds and evidence of long-term neglect. I planted one of my favorite shrubs — a butterfly bush — in the center of this bed, added a few pink zinnias, and have since planted yellow lantanas in each corner (thank You Lord, for lantanas — they thrive on neglect, bloom until frost, and come back every year). The butterfly bush will grow up to 6-feet tall, and it will soon be covered in beautiful purple, sweet smelling flowers. Yes, I know this is a vegetable garden. But beauty. It is important for our souls, sisters. The bed behind the butterfly bush and against the fence is my okra section. I planted the seeds a few days ago, and soon they will rise up and bless the Lord with one of the only vegetables Bill will eat from this garden. Sadly, he will not enjoy even one luscious bite from any of our tomatoes, but he loves okra. I also had a few deep thoughts regarding Adam, the fall, the consequences of sin, and the words God spoke to Adam in Genesis 3:17-18: “Cursed is the ground because of you; in toil you shall eat of it. Both [nutgrass] and [pernicious, unidentifiable weeds] it shall grow for you.” Suffice to say this section of the garden wore me out. But when I finally pulled the final weed from that section, my soul rejoiced. Red, green, and yellow sweet pepper plants have replaced the weeds. And behind the peppers along the back fence, I planted the seeds for my favorite garden crop: purple hull peas! In the bed across from the peppers, I planted something fun and delicious: pattypan squash. At least that’s what my mother and grandmother call it. Others call it “scallop” squash. 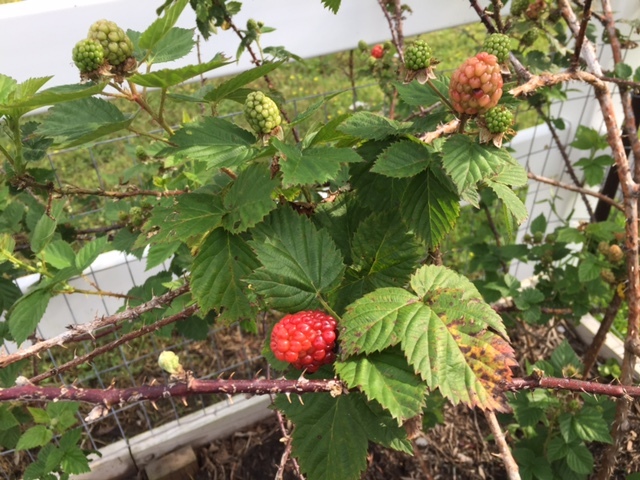 I have never see it in the grocery store, and it does my soul good to grow and enjoy something I can only get in my garden. Currently, Bill and I are enjoying berries from the garden. Yum! Sisters,I am so happy to report that my soul is in a much healthier place today than it was a few months ago. And I give all of the glory to God for that. He is, after all, our Creator and, “He Himself knows our frame; He is mindful that we are but dust,” (Psalm 103:14). And because of that, He created the Sabbath and set an example for us to rest and be renewed regularly. What replenishes your soul? Give it to God, practice it regularly, and experience the rest and renewal that He created you to enjoy. Thank you for holding me accountable, sisters! 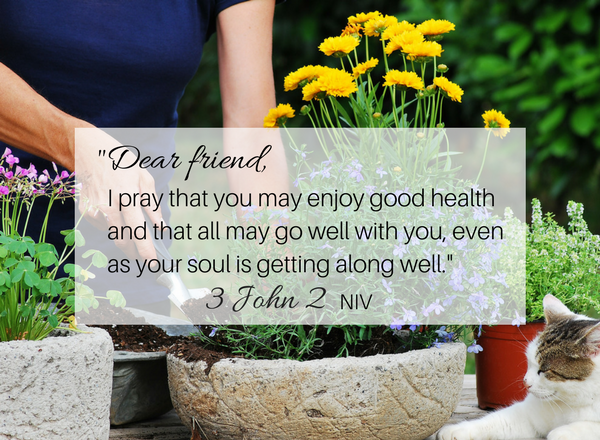 P. S. I’d love to hear what replenishes your soul so post a comment, and let’s be accountable together. The older I get, the more I find sweating objectionable. Anything outside in our Texss summers will likely be denied. The pine cones will be delivered tomorrow and I’ll begin cutting, sealing, painting and arranging them on a wreath. Have you seen the pine cone zinnias? I loved them the first time I saw them! I know Mother loves zinnias, so I’m making a wreath of beautiful, bright colored zinnias for her door. Deadline: Saturday night. The desk may wait, back to artsy! This is what replinishes my soul now. Turning something ugly into something I’m proud of, or creating something beautful with a few supplies, a little imagination, and my two, now sore, hands. Your garden is lovely, with benefits! I’m on Bill’s side with the tomatoes. The purple hulls and the blackberries are another story. 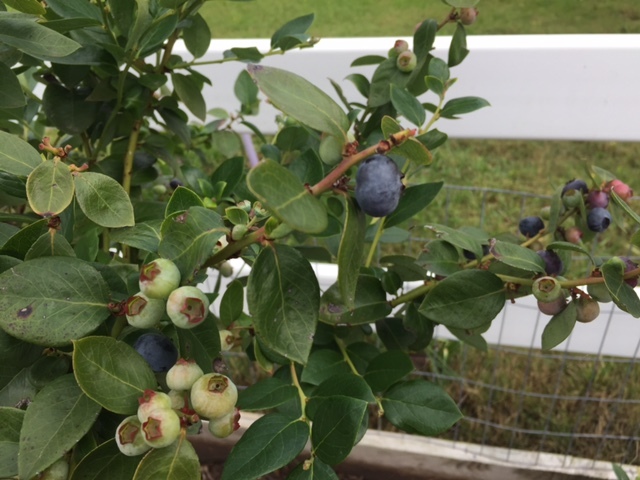 When I saw your blueberries, a childhood memory came to mind. Muskadines! You should set aside a place. From what I remember, they take care of themselves, and they make the best jelly! Loved reading! Happy Mother’s Day Granny! I Love your garden:) it’s beautiful. And so is your soul, Laurie. This piece blessed me richly. Thanks for sharing. Studying God’s word, sitting in the dark and meditating, and talking to people helps refresh my soul. Sometimes, it gets so rough that I find it hard to pray but somehow God uses these means to draw me back to Him. To Him be all the Glory. I am so excited! 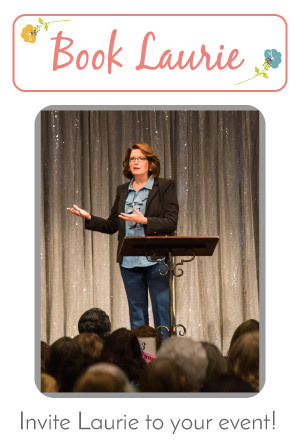 Last year I asked our Women’s Director to host a Laurie Cole study, and next week I get to go to ‘There is a season” for bible study!!! I get to study with Laurie Cole 🙂 and my sisters in Christ at church. I can’t believe it. God is amazing. Thank you. love you bunches! i enjoyed to read . also learn a lot of important point . thanks because u shared it for everybody free . I just discovered your blog in a roundabout kind of way this morning and wanted to thank you for the time & heart I see expressed in your ministry. 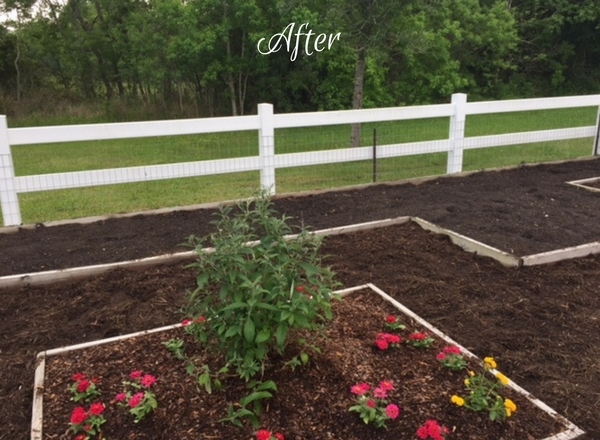 It also gave me an idea of how I could connect even closer to my husband and God through gardening. My hubby loves to garden. (Our big, crazy dogs not so much. They are anti-gardeners, in fact.). I’d like to help him restore our backyard to its former state of beauty. I think we could have some fun doing it too.